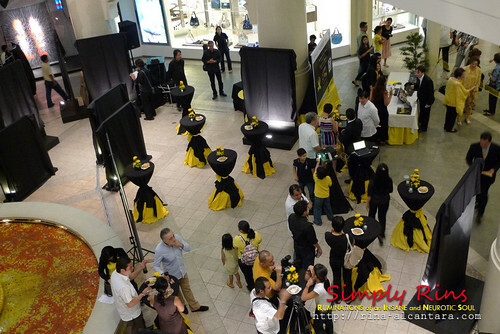 Large panels covered in black cloth and tables in black and yellow. Out of curiosity, we approached the registration table and asked what it was. 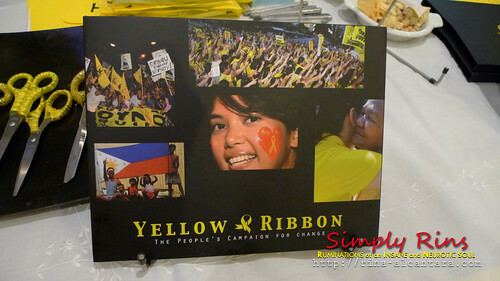 It turned out to be the official launching of a book entitled Yellow Ribbon The People's Campaign for Change. 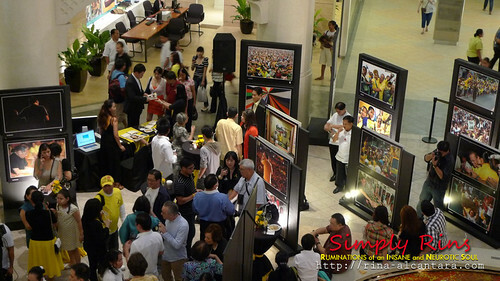 The event entails a photo exhibit that recounts the campaign of Noynoy Aquino for the presidency. Photos that were displayed were taken by Jay Morales, the official campaign photographer of Pres. Noynoy Aquino. The Yellow Ribbon book pays tribute to the Yellow Army of volunteers that supported the presidential campaign of Pres. Noynoy Aquino. The book primarily contains photos taken during the campaign period. Included in the photobook are some articles written by the relatives of the Aquino family. First highlight of the event was the book signing. The second highlight of the event is the launching of a website that will enable other people who have in their own personal way, contributed to the victory of Pres. Noynoy Aquino. They simply called it the Yellow Ribbon Photobook Project that you can visit for details at www.yellowribbonphotobook.com There's also a preview of the book on the site. The concept of the Yellow Ribbon Photobook Project is to allow people to customize their own copy of the Yellow Ribbon The People's Campaign for Change commemorative book. You get to place your own photos into the book! Of course, the organizers of this project appeals to everyone who wishes to participate to only upload photos that are relevant to the theme. They have allotted pages 24 and 25 for your own photos. To get started, simply download the Yellow Ribbon Photobook software from their website, install the program, and you're ready to begin. Yellow Ribbon software interface is very user-friendly. The Yellow Ribbon program is easy to navigate and use. Tutorial is made available within the software that will guide you step by step on how to customize your pages. 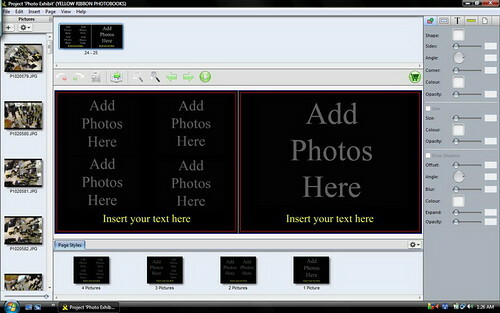 Editing tools are also available such as cropping and photo effects. You also have the option to add text or captions to your photos. Choose from various page layouts when customizing your pages. For good print quality, make sure your pictures are of high resolution. Minimum is 300dpi and the program only accepts jpeg formats. When you're satisfied with your customized pages, save your project and click the cart icon located at the upper right of the Yellow Ribbon program to proceed with your order. Upon checkout, you will be asked to register your account and select a shipping method. You will be recommended to pay via paypal to offer security for your credit card details. For further details, please visit Yellow Ribbon Campaign Photobook.